Texas state dinosaur; Image from Texas Parks and Wildlife* by artist G. Aaron Morris (used by permission). 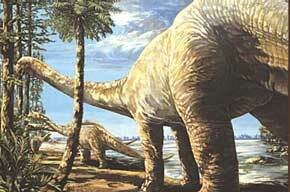 Texas designated Brachiosaur sauropod, Pleurocoelus as the official state dinosaur in 1997. But in 2007, paleontologists re-identified the bones and footprints (left in the north and central parts of Texas about 95 to 112 million years ago) as Paluxysaurus Jonesi. The dinosaur is named for the town of Paluxy in Hood County and for the Paluxy River, both of which are near the Jones Ranch site where the fossils of this species were discovered. * Dinosaur image was copied on 12/08/04 from Texas Parks & Wildlife Department's Web Site: www.tpwd.state.tx.us. Neither this website, nor the information presented on this website, is endorsed by the State of Texas or Texas Parks and Wildlife Department.